Spontaneous coronary artery dissection is an uncommon cause of acute coronary syndrome. This ECG is from an athletic woman in her 30s who presented with 1.5 hours of substernal chest pressure and nausea. She had no risk factors for ischemia. 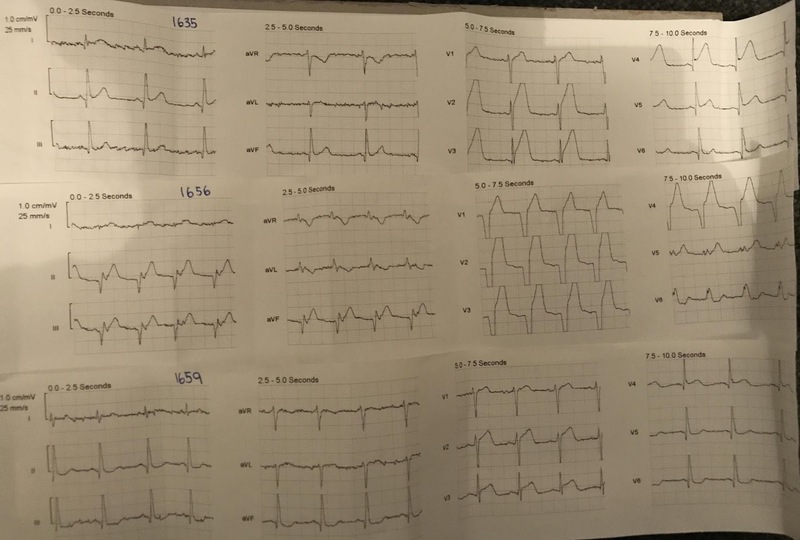 This was the repeat ECG 7 hours later. This ECG is from a man in his 60s who presented with chest pain radiating down his left arm and 2 days of exertional dyspnoea and fatigue. This ECG shows anterior ST elevation with terminal QRS distortion. The cause was Spontaneous coronary artery dissection (SCAD) of the mid LAD. This ECG shows anterior ST elevation with terminal QRS distortion. At 16:56 there is also a LBBB. The cause was Spontaneous coronary artery dissection (SCAD) of the mid LAD. This ECG is from a man in his 60s who presented with chest pain radiating down his left arm and 2 days of exertional dyspnoea and fatigue. This was the repeat ECG 1h after thrombolysis. This ECG shows some ongoing anterior ST elevation with Q waves in V3 and V4. The cause was Spontaneous coronary artery dissection (SCAD) of the mid LAD. This ECG is from a man in his 60s who presented with chest pain radiating down his left arm and 2 days of exertional dyspnoea and fatigue. This was the arrival ECG after prehospital thrombolysis. This ECG shows resolved ST elevation and the Q wave in V3 also resolved.